One thing January does not have in any abundance is garage sales. The thrift store stock of vintage seems to be pretty low too. 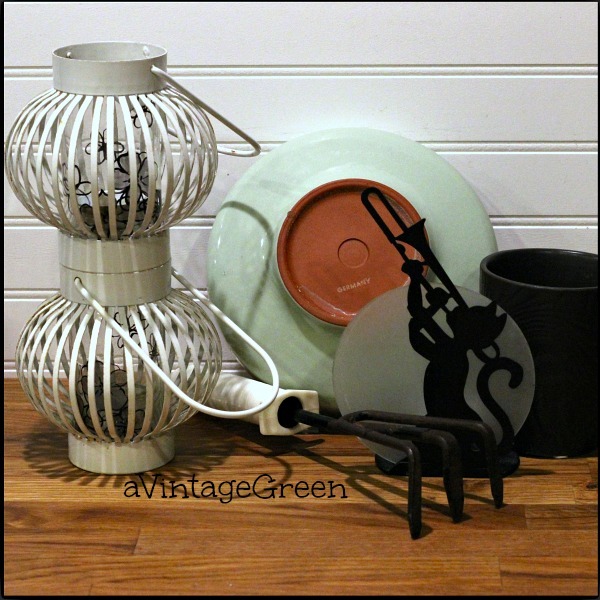 The grouping below (except for the cat) was on the free table at the thrift store and when cleaned up they looked fine. 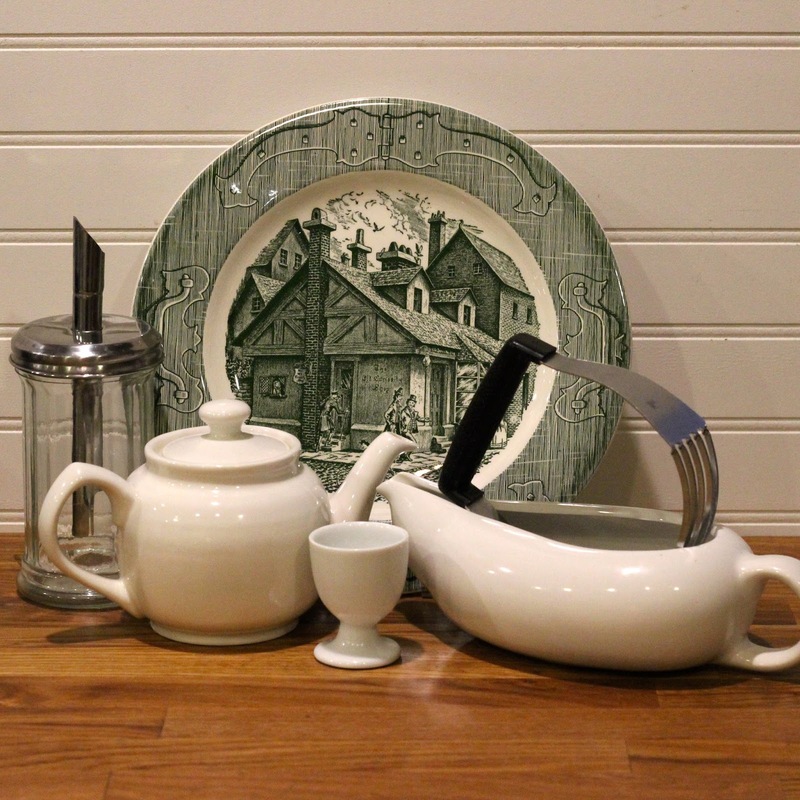 The grouping below was found at 3 different thrift stores; restaurant sugar dispenser, unmarked white teapot, gravy boat and egg cup, pastry blender and a Royal China Old Curiosity Shop Green Dinner plate. My favourite thrifted find this week is the bright yellow with pink blossoms Royal Winton Lynton tea plate. 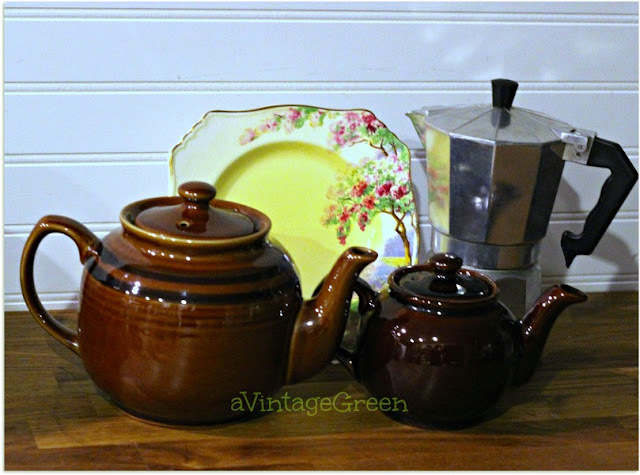 Always happy to find an Expresso Coffee Pot and Brown Betty Teapots. Some things I am sharing here belong to an old friend (80). She and her husband had accumulated an amazing amount of collectibles (and who doesn't) over 50+ years. Her children have picked out what they want so she is letting some things go now. I think this may be a box that held dried salmon for the tourist trade. 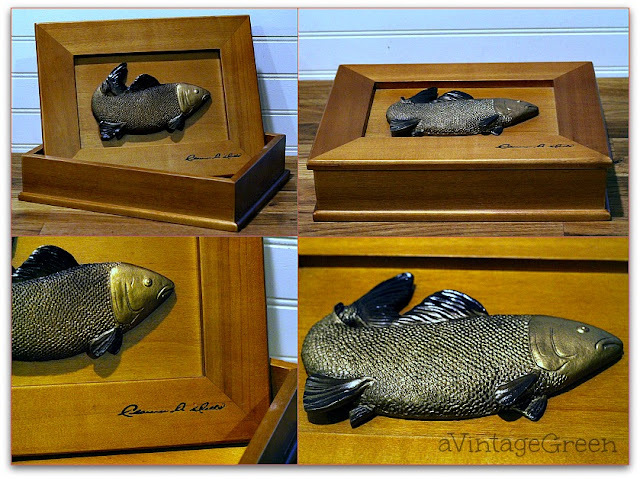 Well built, good moulding of the salmon in resin. Not that old. The trunk-like box has a camel on top, not old. 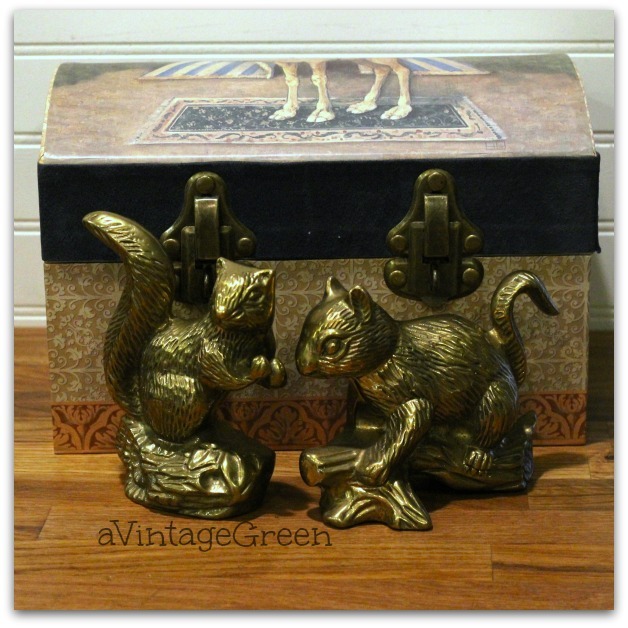 She said the brass squirrels were at least 40 years old, heavy, hollow inside and well moulded. She and her husband had collected a great many decanter and fanciful bottles over the many years. 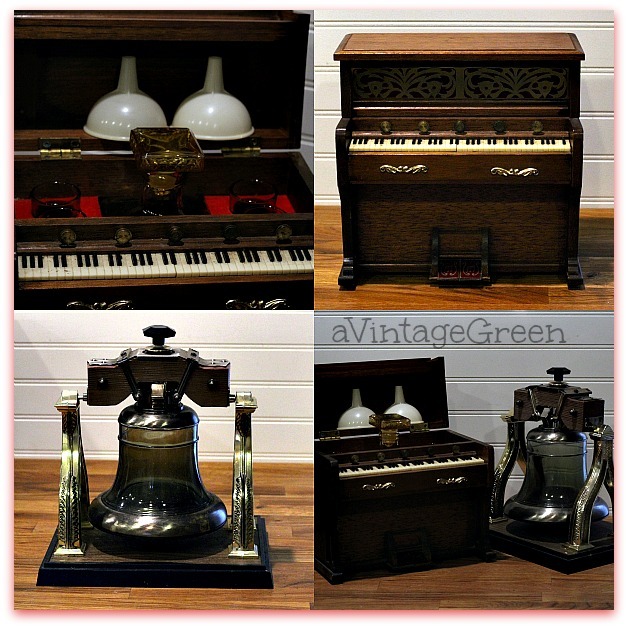 Here are two - a Piano that plays How Dry I Am and a Big Ben Bell that Chimes. This is the fourth slot machine she has brought over. Works. What I am loving right now is the whisper of spring pink tulips in my favourite hand vase, layering them over my Valentine Vignette. Thrifted finds all. It's kinda thin at the thrifts but you have still managed to find some sweet things. 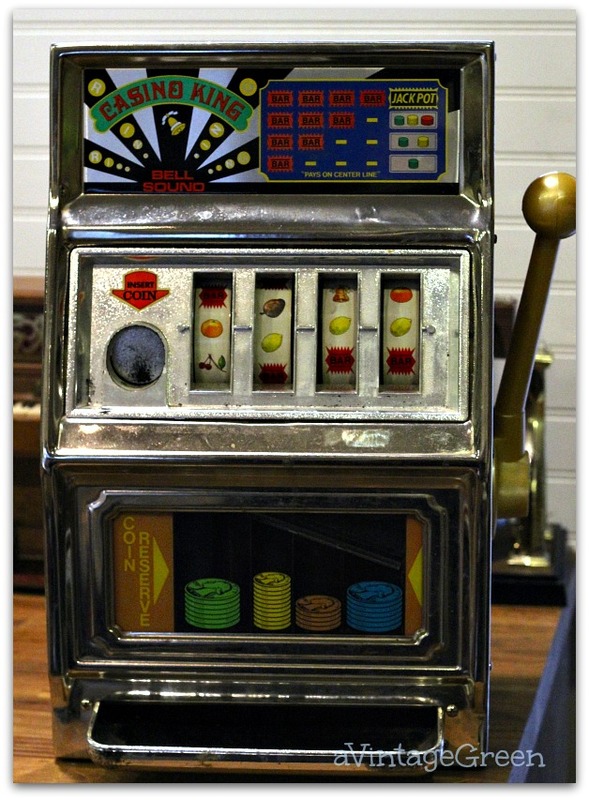 Love the slot machine and that hand vase with the tulips is soooo pretty! Enjoy the upcoming weekend, dear Joy. Hugs! I love everything! Yes the squirrels, the framed fish are awesome, wish I had just one! The slot machine is fun. You got some great stuff, wow! What a diversity of "finds", dear one!!! I'm all into dishes and tea pots!!! 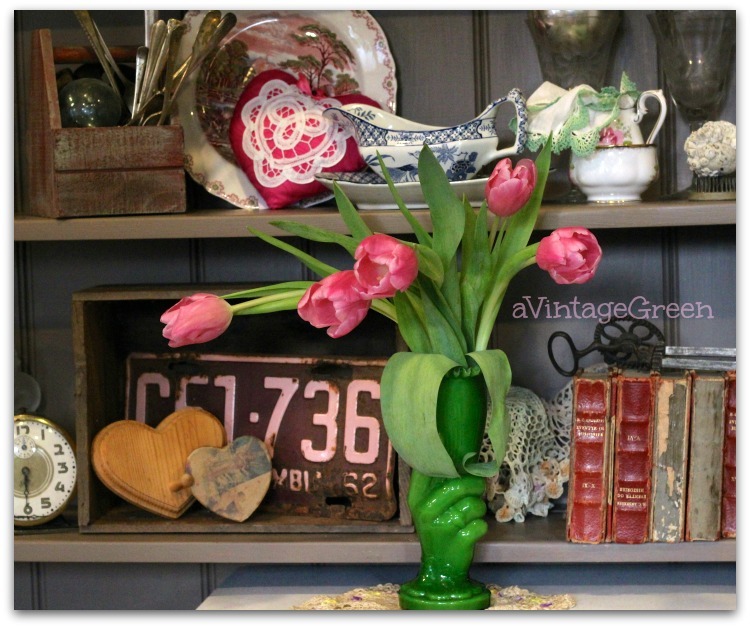 Fun stuff Joy ...love the green hand vase and the tulips. Those squirrels are awesome finds! I am always on the look for squirrel things, something my daughter collects. That had vase is really cool, too. I love looking at your treasures!!! The Brown Betty's.....I love how you know what all the things you find are and their names!! Still some great finds! I'm ready for yard sale season!! Cute finds! 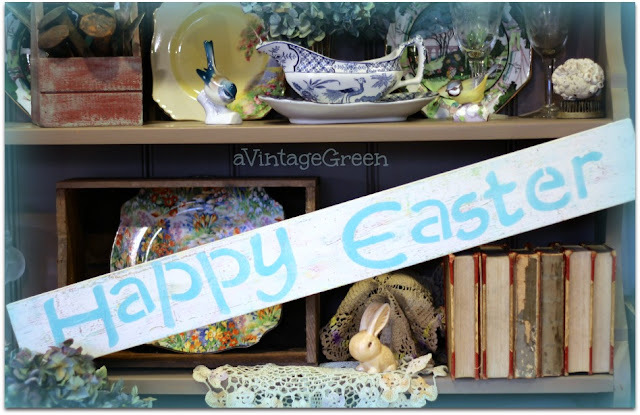 You are making me ready for yard sale and junkin season LOL Thanks so much for linking up at the Table It Link Party, I hope you get some great traffic from it. Can't wait for yard sales this year! Thanks for sharing at Table It! I love hearing the stories of other peoples treasures. Thanks for sharing! Visiting from Thursday Favorite Things.